The United Nations, headquartered in New York, is an international organization of 193 member-states. It was founded in 1945 to prevent another world war. The U.N.'s founding charter mandates four ambitious purposes. It maintains international peace, which is a full-time job in itself. The U.N.'s other three missions help to achieve that overarching goal. It fosters friendly relations between its members, it solves international problems and promotes human rights, and it harmonizes its members' actions. The U.N. has a host of other initiatives. It works to help countries reduce hunger, disease, and illiteracy. It promotes sustainable development and the environment. It protects refugees, provides disaster relief, and economic development. It counters terrorism, promotes nuclear non-proliferation, and clears landmines. It also focuses on protecting indigenous cultures. The U.N. is not a government and has no right to make binding laws. Instead, it uses the power of persuasion. All nations contribute to the U.N. budget, so they each have "skin in the game." That funds U.N. specific initiatives, such as $200 billion for clean energy. Small countries benefit if these efforts are spent in their areas. Every member votes in the General Assembly meeting. That gives U.N. decisions moral clout. U.N. decisions reflect the prevailing values and goals of the majority of its members. Thus, countries that don't comply know they are in the minority. The U.N. committees negotiate multilateral agreements that give more teeth to its policies. Combined, they form a body of international law. How Is the U.N. Organized? The U.N. General Assembly is composed of representatives of all member states. It creates the mandates that guide the day-to-day work of the boards and councils under it. The meeting lasts for several weeks in September of each year. That gives world leaders a chance to come together and form working relationships. The Secretariat carries out the day-to-day work of the Organization. The Security Council nominates its leader, the Secretary-General. The U.N. Security Council is the most powerful U.N. unit. Its mandate is to keep the peace. The five permanent members are China, France, Russia, the United Kingdom, and the United States. The General Assembly elects 10 non-permanent members that hold two-year terms. 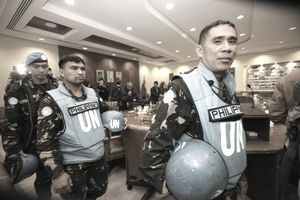 All U.N. members must comply with Security Council decisions. The Council sends peace-keeping forces to restore order when needed. The Council can impose economic sanctions or an arms embargo to pressure countries that don't comply. It authorizes its members to take military action if needed. That gives the U.N. teeth to enforce its decisions on all members. The Economic and Social Council coordinates the U.N.'s economic and social work. The International Court of Justice is located at the Hague in the Netherlands. It settles legal disputes between countries. There are 193 members of the U.N. The United States recognizes 195 countries. The two that aren't U.N. members are Kosovo and the Holy See. Russia won't allow Kosovo to become a member because it still considers it a province of Serbia. The Holy See has not applied for membership, although it has "permanent observer" status. Notably, the U.N. granted Palestine "permanent observer" status, even though the United States considers it to be part of Israel. China replaced Taiwan, which it now considers a province. All peace-loving countries that are willing and able to carry out their obligations under the U.N. charter can join the U.N. All members of the Security Council must approve. Then, two-thirds of the General Assembly must also approve the membership. On October 24, 1945, the first 50 nations who were members of the U.N. ratified its charter. U.S. President Franklin D. Roosevelt lobbied for the U.N.'s creation even during World War II. In the Declaration of the United Nations, the Allies pledged to work together to stop the Axis. The four major Allies were the United States, the United Kingdom, Russia, and China. The other Allies included 22 other countries. FDR's administration worked with Congress to create a U.N. charter that had its support and administration teeth. President Harry Truman continued the effort after FDR's death. On June 26, 1945, the members created the U.N. Charter at the San Francisco Conference. Truman made sure that Congress ratified it right away. The United Nations is the second attempt at a global peace initiative. In 1919, U.S. President Woodrow Wilson pushed for the League of Nations after World War I. It had 58 members but the United States was not one of them. Congress refused to ratify membership, fearing that would pull the United States into countless wars. Many felt the League failed because it could not prevent the outbreak of World War II. The United Nations Climate Change secretariat manages the global response to the threat of climate change. The United Nations Educational, Scientific, and Cultural Organization addresses world hunger. The United Nations International Children's Emergency Fund focuses on the protection and care of the world's children. The World Bank provides financial and technical assistance to emerging market countries. The North Atlantic Treaty Organization is an alliance of 26 countries created to promote peace in Europe. The United Nations Office on Drugs and Crime supports countries' efforts to stop human trafficking. It provides data and research on the global problem. The U.N. buys U.S. goods and services, employs Americans, and benefits local New York City businesses. A U.N. study shows that, for every $1 invested by the United States into the U.N., it receives $1.50 in return. Peacekeeping operations, U.N. agencies, and the renovation of the U.N. headquarters alone added approximately $3.5 billion to the U.S. economy. The U.N. hired U.S. companies to support U.S. troops in peacekeeping missions in Haiti, Lebanon, Sudan, and Liberia. In 2009, this totaled $319 million. The U.N. Development Programme does business with more than 1,800 U.S. vendors.